SCORPION offers a stunning, deep-dish wheel design with a wealth of fitments, and two finish options: Gloss Black Milled Edge & Satin Black Machined Rivet. Scorpion features an aggressive 7-spoke design, with tough-looking deep dish. The Gloss Black Milled Edge option has a striking gloss black paint finish, which contrasts against the bright milled edge of the spokes. The circumference of the wheel is highlighted by machined rivets. 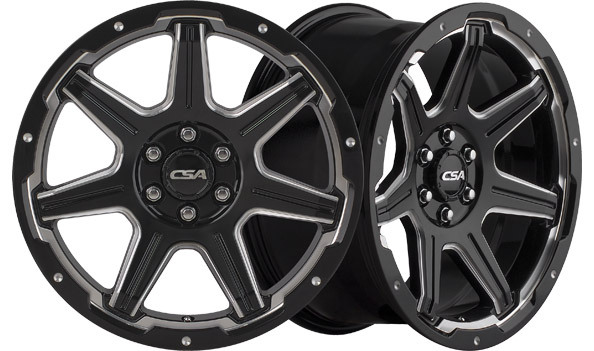 Completing the look of the wheel is a gloss black cap with chrome CSA logo. The Gloss Black Milled Edge finish is available in a small cap option for the 5-stud multi-drill & 6/114.3 bolt patterns. Scorpion is available in a wealth of fitments, & will fit all popular 4x4 & SUVs. Load rated at 1000 kg for 6 stud fitments and 1250 kg for 5 stud fitments.